At Cacciola Iron Works we’ve designed, built and installed many unique and stylish fences. We have a pretty good understanding of what goes on in the background of making a fence purchase. 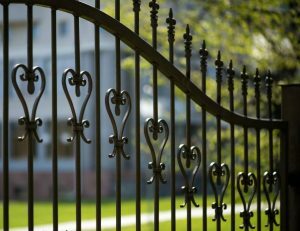 That’s one of the most important parts of the process, so we have put together a brief list of a tips and considerations to bear in mind when purchasing and installing a new iron fence. In many places, you can’t simply add any feature to your property, particularly ones that require construction, which is often noisy and can cause problems to powerlines or pipes if done incorrectly. Usually you can determine whether your area will require a permit just by visiting the city website. There might be some fees involved, but otherwise, it’s a pretty easy process. While you’re looking into any required permits, also note any restrictions your city or neighborhood has placed on things like fences. Sometimes there are height restrictions, other times certain styles, or materials may not be permitted, and of course it may be a combination of the above. As we mentioned, getting a fence installed can be a both messy and noisy, depending on the work that needs to be done. Obviously, you’re the final authority on what happens on your property, but for the sake of relations, it’s not a bad idea to get feedback from your neighbors. Before you start constructing a fence, make sure to get the plans for your property so you know where any underground utility lines are. Damaging them can cause major problems, not just for you, but the rest of the neighborhood, and the cost can be astronomical. Once the plans are finalized, contact us here at Cacciola Iron Works and we’ll get started right away. Our quality and pricing are hard to beat. We’re ready to bring your design to life.